Prominent & Leading Manufacturer from Delhi, we offer cotton printed suits, printed ladies suits, printed salwar kameez and printed suits. Owing to our rich experience and knowledge of this domain, we have been able to offer a wide variety of Cotton Printed Suits. The printed suits are designed from the quality assured cotton fabric and in adherence to latest fashion trends. Owing to its design, appearance, finish and colorfastness, the offered cotton printed suits are highly demanded. Keeping the track of latest happening in this domain, we have been able to manufacture and export the optimum quality of Printed Ladies Suits. 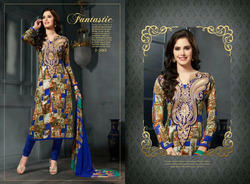 The offered printed ladies suits are appreciated for their alluring prints and elegant design. 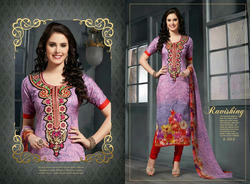 By using skin friendly fabric, the offered printed ladies suits are designed in adherence to latest bollywood trends. We are engaged in manufacturing, supplying and exporting Printed Salwar Kameez. Designed to perfection, the offered salwar kameez is known for its fine finish and elegance. Owing to our team of experts, we have been able to offer this salwar kameez in different designs and patterns. Gained prominence in the industry as a reliable manufacturer, supplier and exporter, we are engrossed in offering our clients with an alluring array of Printed Suits. Our offered suits are designed as per prevailing market trends and are available with us in different designs and patterns. Also, these suits are available at industry leading prices. Looking for Printed Suits ?